Sedimentary Breccia is a reddish-brown rock that can change color and appearance based on the rock fragments present. This sedimentary rock forms from debris from landslides, moving glaciers and cave-ins. This breccia has coarse, angular fragments in a fine-grained matrix. 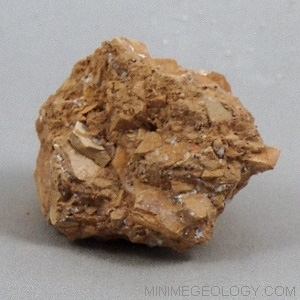 Sedimentary breccia is similar to conglomerate except that breccia has angular fragments and conglomerate has rounded fragments.